Transitional flashings are critical industrial roof components with one purpose – to deflect water and keep it out of the roof assembly. They’re used around all types of roof penetrations and projections, as well as the internal drains, expansion joints, roof perimeter and parapets. Flashed areas are especially prone to damage from high winds or the movement caused by thermal expansion and contraction. 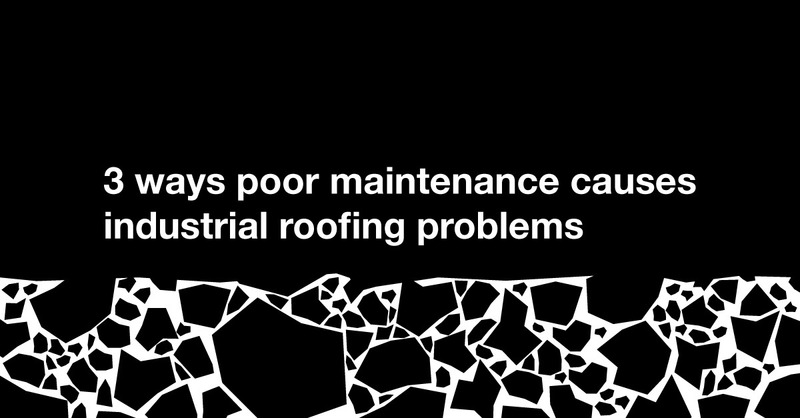 If they’re not inspected regularly and any deficiencies corrected, the roof is vulnerable to membrane billowing and blow-offs or water infiltrations that can cause structural and interior damage. Proper drainage is crucial to the performance and longevity of an industrial roof. If your drainage system design is flawed, it’s inadequately sized or gets clogged with debris, rainwater and snow-melt can pool on the roof surface. Ponding water adds considerable weight that can weaken your roof structurally. If standing water seeps in through damaged areas in your roof covering, it can corrode the metal decking or soak the insulation and negate its R-value. If you don’t have the drainage system and the degree of slope assessed when standing water issues first arise, your roof is at greater risk of slow, insidious damage or a sudden failure or collapse. An industrial roof’s largest element area-wise is the membrane that sits fully exposed to the harsh elements. Having the roof field thoroughly inspected by a knowledgeable roofer with expertise in your particular type of system can catch developing issues like seam or lap separations, splits, cracks or punctures, or bubbling and blistering early on. When inspections aren’t performed on a routine basis, you’re losing an opportunity to make effective repairs or take preservation-minded steps like having a waterproof coating applied. If you allow the deterioration to escalate, you’ll likely face extensive damage that’s much more expensive to fix, or even a premature tear off and replacement. If you need skilled industrial roof repair services in Western Massachusetts, New York or Bergen County, New Jersey, contact us at Vanguard Roofing.